Publisher: PAUL H. BROOKES PUBLISHING CO INC. The second edition of this practical, research-based, and accessible book offers early childhood educators a framework for successful and meaningful inclusion of preschoolers with special needs in classrooms. This book offers teachers effective, research-based instructional practices to promote learning in their inclusive classrooms. 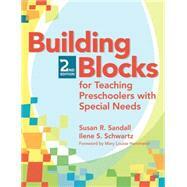 This book's building blocks model provides three practical methods teachers can use to include young children with disabilities in the classroom: curriculum modifications that allow all children to participate, embedded learning opportunities that are used within typical classroom activities, and child-focused instructional strategies that help students achieve individual learning objectives. It explicitly explains the relationship between specially designed instruction, (high quality early childhood programs, curriculum modifications and adaptations, embedded learning opportunities, child-focused instructional strategies) and outlines the principles of universal design as an approach to accessing the general education curriculum. And, this edition shows how Building Blocks can be used to improve children?s function outcomes in relation to federal requirements in early childhood special education.